The whale-back shape of Pendle Hill as seen from the north is unmistakable. It is a predominant landscape feature identifiable from many of the walks in this series. The view from the Beacon or Big End of Pendle is a 360 panorama over the Forest of Bowland to the north and the Lancashire mill towns to the south. The top of Pendle is relatively flat moorland divided by the sickle shaped Ogden Clough. 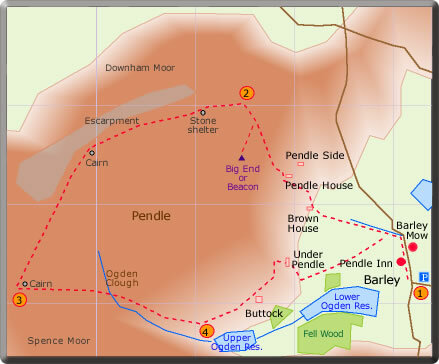 This circular walk of Pendle offers a variety of walking experience: from Barley to the summit (the hard bit), an easy partial circumnavigation of the plateau following the sharp escarpment, a gentle descent along Ogden Clough, and finally a pleasant return through meadow land back to Barley. The views on the walk are constantly changing and are quite spectacular and well worth the effort of the initial climb. The village of Barley possesses a car park in which there is an Information Centre. The Pendle Inn with its sign of a Pendle Witch is a popular pub offering a wide variety of food and beverage. The Barley Mow is newly opened and offers real ale and a wide food menu.